It always feels so inappropriate. Pussybows. I love them, but say the word in a store and all of the blue haired ladies drop their eyes and say a little prayer. This top from the Jessica Simpson plus size line has me feeling all Gossip Girl like. 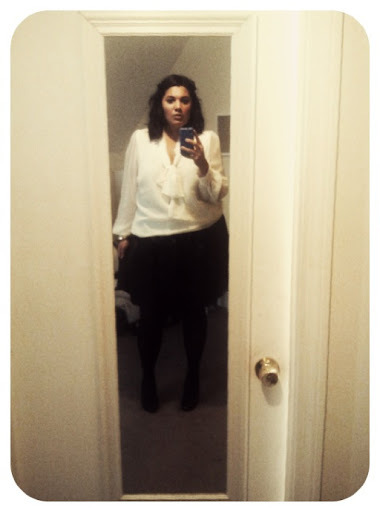 Of course when wearing something so pretty and light colored, you have to stay away from the red wine and messy foods. Thank goodness for pumpkin beer! Sorry for the mirror pic, but what can you do? Have a great week! I know exactly what you mean, but if you can pull the look off then go for it I say!